Designers and engineers in recent years have done a lot in order to protect the work of the sapper. He is assisted by powerful mine detectors, demining charges, georadars. However, all these devices weigh a lot. A set of equipment can pull up to 50 kilograms. The sapper will be made easier by a passive exoskeleton – a mechanical design that takes on all the load. “MK” learned the parameters of the device, which will soon go to the engineering troops. Passive exoskeleton for carrying goods received the name EO-01. It is designed to remove the vertical load on the person when carrying goods. 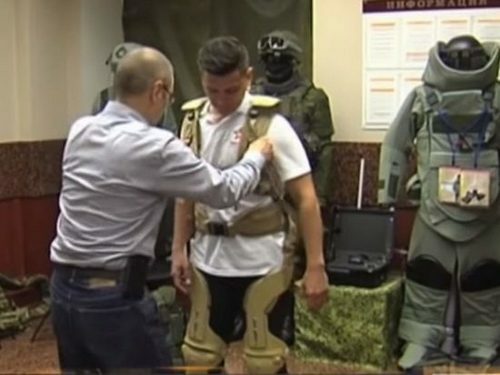 According to the Ministry of Defense, the MK included in the complete set of wearable engineering equipment, for example, a demining charge of the SRP-2, a sapper’s backpack, a remote control of the Uran-6 robot-sapper, and a portable Pelena jammer. The total weight can be 50 kilograms. Of course, it is possible to lift such a load to a strong person. And if you need to carry a few kilometers? This is harder. This is where the exoskeleton comes to the rescue. It is easily assembled and disassembled from components. At the heart of the frame – lever-hinged design. She repeats the ankle, knee and hip joints. Artificial bones are fastened with a belt system. There are also damping pads in places of contact with the body. All components are packaged in convenient cases during transport. The mass of the exoskeleton EO-01 is five and a half kilograms. But he allows a person to freely carry up to 50 kilograms of cargo. The design of the exoskeleton can be individually adjusted depending on the height and physique of the sapper. Height adjustment is possible up to 15 centimeters. The set of exoskeleton for transportation is less than half a meter in length, 25-30 centimeters in width and height. Minesweeper can independently, without assistance, assemble the design of the exoskeleton, adjust its size to fit, put on, take off and disassemble. It will take a little more than ten minutes to assemble and fit. It takes two minutes to clothe in an exoskeleton, in order to take off – one and a half. It is possible to dismantle the entire structure and lay it for transportation in six minutes. By the way, a soldier dressed in an exoskeleton can get into the car. The design can be used, not wearing, for carrying goods on flat terrain. According to the military-scientific committee of the engineering troops, which turns 200 years old in March, the use of the exoskeleton EO-01 when performing combat engineering tasks increases the effectiveness of the use of engineer-sapper units.